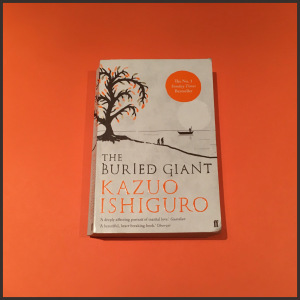 For Ishiguro’s first novel in ten years this packs a good ol’ punch! Wow, I loved this book it is firmly on my re-read pile (does anyone else have one of these?). The story, and it is a story in the traditional sense, is narrated by a third person who sets the scene – forthe more modern reader -of anEngland (post the legend of King Arthur)where”icyfogs hung over rivers and marshes, serving all too well the ogres that were then still native to this land“. But do not fear:”ogres were not so bad provided one did not provoke them“. There is a mist that descends this version of England created by the breath of a mythological dragon which keeps all in a permanent state of amnesia. Here is Ember a 17 year old girl with a passion for the dead, her father suddenly dies and her long lost “family” pops up to save her from this smoking hot guy. Who would have thought that you would wake up one day and question whether or not your human but that’s exactly what happens when she gets dumped into a house filled with Werewolves, witches, a reaper, a banshee and an adorable faery. Will she be able to control this enormous power building inside of her? I love how the storyline flows keeping you just around the corner until BOOM something happens. Half the time it’s not even what you expect to happen. Lucia Joyce is the daughter of famed author James Joyce. A passionate, joyful young woman with a real zest for life. As the story unfolds you journey with Lucia as she tries to find her place in the work under the shadow of her Father. A marvellous dancer and artist in her own right. This story delves into the fictionalised life of Lucia Joyce. With compassion and creativity Annabel Abbs guides you through the disappointment and heartbreak that ultimately lead to Lucia’s downward spiral. It only takes a few chapters to realise that Annabel Abbs is an amazing writer. Her characters were well-rounded and had true conviction. With an amazing array of supporting characters with wildly different views and diverse backgrounds, this book was full of life and emotion.